Grain Weevils( Sitophilus granarius), also called "Wheat Weevils" are very interesting creatures. They have snouts and resemble Ant Eaters. 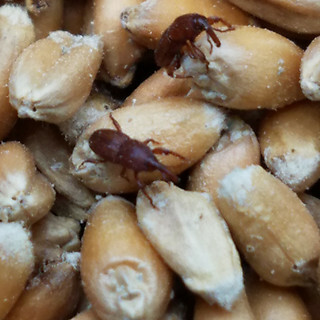 Grain Weevils are raised on grain. We raise ours solely on wheat and we ship Grain Weevils in a wheat culture. Each female Grain Weevil will lay 100 to 200 eggs in her lifetime. They lay one egg in each seed. Only one egg per seed and the female somehow knows which seeds have been impregnated. The larvae spends its youth in the seed where it eats, plays and grows. The adult emerges as a fully formed beetle. It mates and the process begins again. Breeding Grain Weevils is easy. The Wheat Weevil Beetle does not need anything to drink so a seal ed container with wheat berries or some other grain and a lid are all you need. You will need a lid because Wheat Weevils climb. The population will double every month if you provide temperatures between 75 and 80 degrees and fresh wheat. 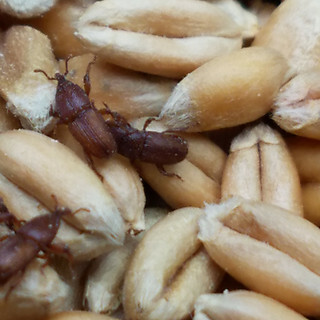 Important: Grain Weevils(Sitophilus granarius) are regulated by the USDA. We are licensed by the USDA to sell Grain Weevils and we will send a copy of our permit and letter with every order. We cannot ship to Alaska, Hawaii or Puerto Rico. The culture you will receive is an established 12 Ounce Culture and will have the seeding date on the culture. The "Seeding Date" is when we seeded the culture with newly hatched beetles. Pay exact cost to ship VIA USPS Priority Mail and not a cent more.